Another Anti-Clinton Writer Found Dead From A "Self Inflicted Gunshot"
Discussion in 'The War Room' started by TheStruggle, Aug 5, 2016. MERICAN FREE PRESS contacted the State College [Pa.] Police Department this morning for any news on the suicide of Victor Thorn, whose birth name was Scott Robert Makufka. 46 people who were close to the Clintons have died during their 3 decades of political power. That number should give us all pause. fonzob1, Big_Chief_Stove and Blackened like this. The Clinton body count rises every year. I remember earlier this year a guy was gonna testify against her and he died too. Big_Chief_Stove, irish_thug, glennrod and 5 others like this. Kuggk, M3t4tr0n, Goatenstein and 5 others like this. can mastermind many political assassinations w/ zero evidence or charges stemming from it???? INTERL0PER, Kuggk, Cid and 24 others like this. Yep, that's exactly how they'd do it. Kuggk, 7437 and mike sherry like this. 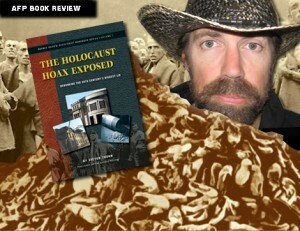 Victor Thorn wrote a book called "The Holocaust Hoax Exposed." Yes, I'm sure this is the kind guy the Clinton's worry about. He was not a "Clinton researcher" he was a crazy propagandist conspiracy theory nut jub. Kuggk, Dayman1984, Cid and 16 others like this. The Clintons were unable to hide the meeting between Bill and the Attorney General. And yet they were able to hide 54 political assassinations? panamaican, 7437, M3t4tr0n and 8 others like this. War Room is becoming Conspiracy Theorist Central. Someone is, at this point, is a favorite to becoming president is going to bother to have some random writer killed just because they wrote some bad things. Soul_of_Rage, 7437, M3t4tr0n and 4 others like this. Bro, you think this was just a video game? Didn't they say that Vince Foster died from a barbell related incident? M3t4tr0n, Kafir-kun and HunterSdVa29 like this. Hillary is evil and even demonic if you ask me. She has people probably some unseen spiritual beings working through her that want to see her move up through the political ranks. That's probably why there is such a crazy high number on the Clinton body count. She is lesbian according to people that Bill told. So Hillary doesn't even care if he cheats. She's about getting elected. When you're arrogant, you think you can do what you want. TheComebackKid, mcveteran81, glennrod and 4 others like this. To think they are going to bother to off people who are no threat to their current or future political power. INTERL0PER, ucunc156, snakedafunky and 1 other person like this. Hillary is evil and even demonic if you ask me. that's all fine and dandy, and I agree on some of that. 7437, AnGrYcRoW and Kafir-kun like this. I edited, I believe she's got some evil force behind her wanting to see her move up in power. MART!AN, Rex Kwon Do and ucunc156 like this. It's all Trump supporters have left, leave em alone. AnGrYcRoW, m52nickerson, Crazy Diamond and 1 other person like this. It is seriously scary that the far right is truly embracing this stuff and that is is now becoming accepted among st the mainstream. This is the danger of letting conspiracy theories grow. How long till someone tries and attack Clinton based off this false propaganda? AnGrYcRoW and Crazy Diamond like this. No one has asked you, no one will ask you, no one cares what you think, no one wants to hear your opinion - Because: You are a person who suffers greatly from mental illness. You're insane - normal people don't value the opinions of the insane. Throttlehead, sickc0d3r, m52nickerson and 5 others like this. No man, you don't understand. Clinton had him killed for sure. His next book was going to be about Chemtrails and was likely to have sales in the several hundreds. She just knew she could not allow it to happen. She had to stop him. Kuggk, Dayman1984, 7437 and 9 others like this. "Obama hasn't created real jobs it's all part- time jobs. All part of his communist/Marxist plan to feed into people's anger at stifled wages and demand communism. The economy isn't really growing it's shrinking and the government and markets are all riged by Obama and Jews!!! Obama and EPA are stealing farmers and ranchers land!!! And the earth may be flat!! Also, evolution is a man made lie and creationism is real. Global warming is also a illuminati hoax for more power"
INTERL0PER, Crazy Diamond, ShinkanPo and 1 other person like this.